The Sandbox Test Server releases today! Apply to participate in Sandbox testing! Sandbox is a limited-access server for testing new balance prototypes in World of Tanks. Through the use of this tool, we plan to test and refine new balance changes. From the data we gather from such testing, we will select the most relevant implementations that meet specific requirements, and which are approved by our game community. NOTE! Access to the test server can be terminated or restricted at any time for non-compliance with the EULA and Terms of Service. In particular, pursuant to paragraph 17 "Beta Tests" of Terms of Service, “the beta games, including information about features and functionality to be offered as part of the games, are confidential.” Any information sharing from Sandbox server (live broadcasts, video reports, etc.) is prohibited without coordinating it with Wargaming representatives. You can request consent for publication of such materials in this special thread on the Sandbox forum. In the first iterations, the focus will be on testing Tier X vehicles. Approved solutions will be applied to vehicles of lower tiers as well. We do not guarantee the implementation of changes-in-testing on any final versions of World of Tanks. The final implementation(s) will be made depending on the information collected and analysed. Increase the armor importance in the game: Currently, armour is significantly less important than speed and firepower in WoT. We would like to make armour play a bigger role in the game. Reduce the cost of mistakes made by players in battle: We want to encourage players to fight actively in battles. By improving the way armour works in the game, the game will allow players to fight more actively without fear of going straight to the Garage right after being spotted. For example, penetrating a tank at long distance should be difficult. Decrease the risk of being focused on at long range: By improving the way armour works, we can increase vehicle survivability, even if a vehicle is under fire from several attackers at long range. Covering directions and focusing on spotted vehicles will become less effective in general, because it will be harder to penetrate armour at long range. Shorten combat ranges: We want players to engage each other at shorter ranges, because long-range clashes should not be the ultimate way of achieving victory. Vehicles should perform unique roles: tanking, pushing through defences, etc. Increase the variety of gameplay: By giving different types of vehicles unique roles and providing the vehicles with the right features for their given roles, battles can be played in many different ways. By choosing a certain class of vehicle, players will choose a particular form of gameplay. Increase game intensity: Changes to armour penetration at distance will encourage players to be more active in battle in order to secure victory. Note! Players will not be able to purchase premium shells for game credits in the Sandbox test server. Some of the main game mechanics will be changed on the Sandbox test server in order to achieve the balance goals listed above. In line with the goal of decreasing the range at which combat occurs, we will adjust the grouping of where shots land within the aiming circle, so as to increase the survivability of vehicles. The effects will be especially noticeable at long range; vehicles will be able to survive focused fire coming from long distance, because players will generally have to aim their shots more carefully. Under the new changes to be tested, armour-piercing capacity will decrease more significantly at long distances in order to increase the importance of armour in the game. Long-distance shots will become less effective, in order to encourage players to actively engage in close-range combat. They will have to fight more actively and make good use of manoevres to effectively fight enemy vehicles. With these changes to armour, the chance of penetrating a vehicle from the front will be decreased at long distances. Thus, heavily-armoured vehicles will be able to head into battle without fear of being picked off easily at long range. Currently, as of Update 9.15, players can still effectively shoot from far distance. Values of armour-piercing capacity for Sandbox are displayed in the art. The distance at which armour-piercing capacity begins to fall off is also specified. Initially, there were only a few guns in the game. Gradually, many high-calibre guns were introduced. For this reason, the guns should be reworked. 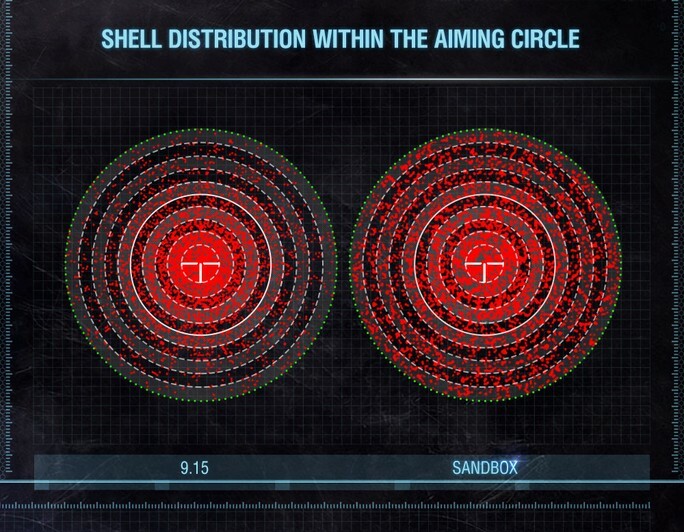 Within the Sandbox feature, we plan to test a new system of distributing damage per shot for different guns. The goals of the new system are to decrease the risk of being destroyed with one shot and also to increase the importance of a gun's damage per minute. Because we plan to increase vehicle survivability in battle, fast vehicles featuring poor armor will also be improved. We will explore the relationships between suspension speeds and turret traverse speeds for each vehicle type within the class and role systems. Fast vehicles will be able to use different manoeuvres to outflank slower, heavily-armoured vehicles. Currently, all vehicle types can perform different roles -- vehicles of each type (except for SPGs and some light tanks) can perform different roles effectively. However, this also means that players use similar tactics when driving different vehicles of the same type, which can make gameplay monotonous regardless of the fact that they are not using the exact same vehicle all the time. In general, the focus will be on reduction of Manoeuvrability and View Range, which contributes to role-based gameplay. These changes are not final and may be altered in future depending on the feedback from the game community participating in the test and the results of statistical analysis. Explosive blast: Explosive blasts happen at the same time as splash damage after a shell explodes. Tanks caught in the blast radius will suffer a temporary debuff to performance characteristics. Damage caused to the affected tanks is counted as damage caused with the help of the SPG player. Allied SPG Aim Indicators: These indicators will display the approximate areas at which allied SPGs are aiming. If the SPG is not aimed at a particular vehicle when the player presses the "Attacking" button (the T key by default), the special indicator is displayed (in the opposite case, the normal notification that for attacking this vehicle is displayed). The marker will be displayed in the corresponding area on the minimap and on the in-game terrain. A notification with the SPG's readiness status (loading/ready to fire) will also be displayed. This feature should help players to coordinate actions. Alternative aim for SPGs: A new way of displaying SPG aim, which is similar to sniper mode, will make it easier for players to aim with SPGs. Based on these changes, the SPG will essentially switch from dealing damage to specific players to dealing damage to concentrations of enemy tanks.